I finished the Jackson 50/50 50K last weekend. I am hobbling around the house this morning. Yesterday I asked my son to help me get my pants from downstairs so he could help dress me (practice for my old age). On race day I got up 2 hours before the start just fine. I put on my own pants and walked around all by myself. I stayed at the Pyoca lodge with Rachel to avoid delays getting to the race. Rachel and I headed to Indiana the night before. I love the road trip part of a race. I got to know Rachel through in our interaction online. Talking with her during the drive was amazing. Imagine what a Latina and Pinay might have in common and the ride was just like that. It was about an hour from home. We got to the lodge at dark. The first thing we did was check into the race. Then we got our things from the car and headed to our cabin. Our room had 4 bunk beds. The room was clean, simple and had its own bathroom. There may have been 8 rooms just like that in our cabin. At the end of the hall was a common area with a sink, coffee maker, dishwasher and fire place. We would see runners later that evening sitting around the fireplace drinking beer and bourbon. Observing them, one might think they just finished up skiing rather than getting ready for a race. This might be one of the reasons I love the ultra-running community. Rachel and I hung out with them after a few rounds of Batman/Superman/Wonder Woman Uno. Our bunk mates were doing the 50 miler. I was a little apprehensive about bunking with people I didn't know. Rachel and I even signed up for the upgraded room with less occupants for 10 extra dollars. Our bunk mates were awesome. I recognized Brenda when we checked in. She told us she was from Indiana and that she didn’t get into ultra-running until she was 40. She told Rachel and I that we were at the perfect age in the sport. Our other bunk mate, Sarah told us she was from Ohio. She said she started doing 50 miles after she started doing 50Ks. I think Rachel and I had stars in our eyes thinking these women were phenoms for taking on such a distance. They thought we were the same for being there. We talked like old friends. That night Brenda rubbed her feet with Vicks Vapo rub. I thought to myself it us something I would do when I got home. The smell was great, clearing my sinuses. I knew the next day would be in the high of 50’s but that night was very much winter. At 7pm, Rachel and I headed back to the main lodge for dinner. I brought my own pasta. The lodge had baked pasta with meatballs, garlic bread, salad, cottage cheese and canned peaches. I added the sauce and meat balls to what I brought. I can’t remember what Rachel and I talked about during dinner. More than anything, I felt that we were old friends and about to undertake our longest run together as a team. Rachel schooled me on the history of Puerto Rico. She said Puerto Rico was inhabited by indigenous tribes. The Europeans brought over slaves with them. The result is a diverse Puerto Rico. Of course there is more to it than that but I don’t want to digress. We talked about life in between worlds. I talked about my undocumented past, not American enough for my peers and not Filipina enough during my last visit to the Philippines. We did all this amidst the other runners at the end of the hall. They were crowded around the fireplace and we sat on a coffee table. We all turned in around 10 o’clock. I was amazed the other runners were drinking beer and bourbon the night before an ultra-marathon. This is normally not what I would do the night before a race. I would have been in bed listening to music. Before bed, I opened an envelope from my coach marked “night before the race”. It was a poem that she had had in her days as a runner in high school. She also reminded me to remember “why” I was doing this and to savor the time with my thoughts. 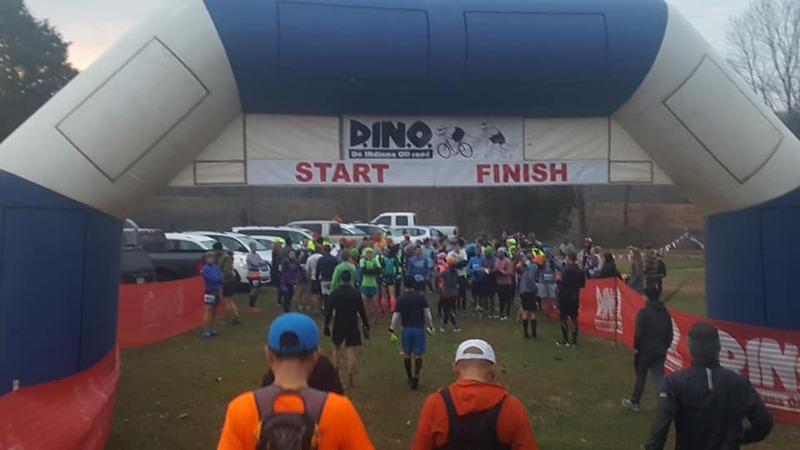 The 50 mile started at 7:30 am. The 50 K started at 8 am. We all set our alarms at 6 am. Rachel and I wanted Brenda and Sarah to use the bathroom first. We all agreed that we didn’t really sleep but Brenda told us that she went to the bathroom during the night we were all silent. As the ladies got ready, I opened another enveloped marked “race morning”. It was from my friend Tammy that reminded me that even though running 30 miles would hurt, I had trained to tolerate the pain. It was weird having so much time before the start. I had my usual 2 hard-boiled eggs. I also ate a protein bar and gluten free toast with sunflower seed butter and jelly. I ate more knowing I had 2 hours to digest. Some of the runners brought a hot shot and Starbucks VIA. They were kind enough to share in my desperation for routine. Despite the previous day’s wardrobe indecision, I put on old capris, sports bra and a purple shirt I had worn all year for races. I put on Body Glide on the insides of my arms, since that skin tended to chafe. I put on compression socks (for warmth), a hoodie and neck gaiter. I decided on my Brooks Cascadias knowing the climbs ahead of me. I wore a mesh hat and gaiters. The gaiters were a last minute decision. It was a minor adjustment that I was okay to try on race day. I asked Rachel for help putting on my bib. She had it on her right leg. She said she had seen our friend Marian do it. I didn’t want it under my hoodie. It was another minor adjustment I was okay to try. After we strapped on our hydration packs, we were ready. Rachel and I had a drop bag. Mine contained extra clothes, headbands, food, my knuckle light and my old GPS watch. After every loop (10 miles) the runners could come back to the room, which was a command center for the race organizers and aid station. 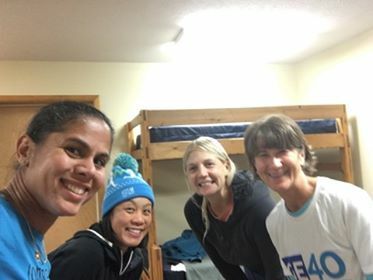 In this room, we met up with Jaclyn, a fellow MRTT-er also running the 50K. We started under D.IN.O’s massive arch. It would take us around the lake before we were on the course. It was around 1 mile, which would give us the extra to make 50 K. We were crowded at first since it was all single track. It was also beautiful since the lake was calm and a mirror for the sky and trees. I trail run to sight see these things. Rachel, Jaclyn and I traversed together for a few miles. Those first 3 miles out of the 10 mile loop were pleasant, flat and scenic. Jaclyn and I pulled and head of Rachel. We chatted a bit and didn’t realize we lost Rachel. We were together up and down the ascents and descents. The night before someone advised us not to barrel down the descents (which is how I trained) because the trail was obscured by leaves. At high elevations the ground was dry and loose. I learned from books and experience to let my upper body help with the ascents, resting my hands on my thighs during the climb. When my legs pushed the ground beneath me, my arms held up my upper body (which explains my sore upper back). The ascents got harder as we progressed. There seemed to be more uphill than downhill. I had to lean forward through all the uphills so I didn’t fall backward. Jaclyn and I were relieved that the trail over the bridge took us out of the woods. We decided to use the bathrooms straight ahead rather than the ones to our left to avoid another down hill. This is where we made our mistake. We made it up Pike’s Peak before Jaclyn asked another runner where he had come from. We realized we had made a wrong turn. We paused to let this sink in. We didn’t know where we missed the turn. Ultimately, neither of us would accept a DNF (did not finish). We made our way back down the hill and back to an aid station. They directed us back to the bathroom we used. From that vantage, we saw the flags leading downhill after the bridge toward the other set of bathrooms we didn’t want to use. I tried to contain my disappointment at our mistake. At that point, I knew my goal to finish before dark might not be possible. We saw Brenda while we were looking for the correct route. She knew right away what happened. I should note she was smiling and full of energy. I was relieved to be back on track. We made our way around a small lake, the Hi-5 zone which was 2 way traffic on the course and finally to the area around the lodge. I’m not quite sure how it happened but at one point, Jaclyn hit her foot on what was underneath some leaves. She caught her breath and waited a moment before she started to walk. She was unsure if she could continue the race. When we got back to our drop bags, she changed socks and composed herself. I gave her 3 ibuprofen and we moved on. When I got the ibuprofen from our room for Jaclyn, I was able to put an envelope in my pocket from my Jeanette. The envelope was marked "pull out as needed". This would be our second loop and would be the hottest part of the day. I pulled my compression socks down and switched out my hat for a headband. I thought I would switch to a t-shirt but I didn’t. The stop and go nature of the course left me in a cold sweat, even when the temps peaked at 50°F. I was hoping the aid stations would have peanut butter and jelly sandwiches. I ate a Reese’s peanut butter bar. I also drank Coke and Gatorade. The volunteers were kind enough to fill my water bottles. I was disappointed that my honey stinger waffles hardened despite the warm temps. In my arsenal of nutrition, I enjoyed the Lara bar and RX bar the most. At one point I don’t think I ate soon enough and experienced a low. The candy bar felt thick in my mouth. I drank some coke at the aid station and read a note from the envelope. I also told Jaclyn who talked me through the low until the Coke made me feel better. I regretted not packing my own sandwiches. I took it for granted that they are staples at trail races. In my low, knowing my family were on the way to the race, I dreaded that they would have to wait a long time for me to finish. 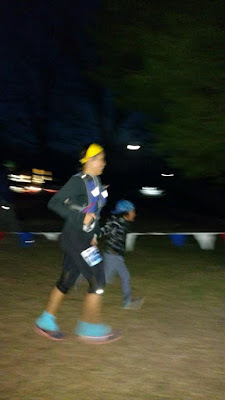 I dreaded finishing after sunset and felt fatigued. I celebrated when my watch indicated 26.2 miles, which was the longest I had ever run. When Jaclyn and I made it to the lodge I was relieved. I didn’t want to go back out. We saw our friend Harmony. She recognized a bag from a race we did together at Land Between the Lakes. I had written my name on it. She brought us cupcakes. She had signed up for the 50 K with us but sustained an injury. She picked this race since it was the day of her birthday. An ultra-marathon would have been a way for her to celebrate her love of running. In her inability to run, she came to celebrate us. Seeing her happy and serene lifted my spirits. I remember a podcast saying if something isn’t working to change something, anything. I wasn’t able to run faster so I changed my shirt and socks. It made me feel less like I had been running for several hours. Harmony told me she wasn’t giving up on Louisville. This knowledge was another adjustment that made me happy. She also told me that Rachel came through about 10 minutes before we did. I might have given her a hug before we headed out. Angelo texted me to let me know he and Julian had arrived and were parking. If I was anxious over them waiting for me, I was glad they were there. Jaclyn and I told ourselves that we were really doing this thing. By now we were slower. Every ascent and the space in between ascents was a walk. My thighs were very sore. I couldn’t descent taking normal steps. I shuffled. Jaclyn, a stronger runner than I am, surged ahead. The day was waning. I enjoyed the explosion of sunlight on the other side of the tree line. I enjoyed the time alone despite the pain in my legs. I told myself to look at these things because it was all the things I enjoyed about running. I didn’t want the pain to take that away from me. I didn’t take photos during the race. I didn’t want to be distracted. I wanted to take in my surroundings with my eyes not behind a camera. In the last few miles, I had to remember my “why”. Running in the space of a workday was laughable. This was probably why my ultra-running homework was explicit about the strength of the "why". If it was strong enough, it would push you through the end. It took me a while to figure out my “why”. 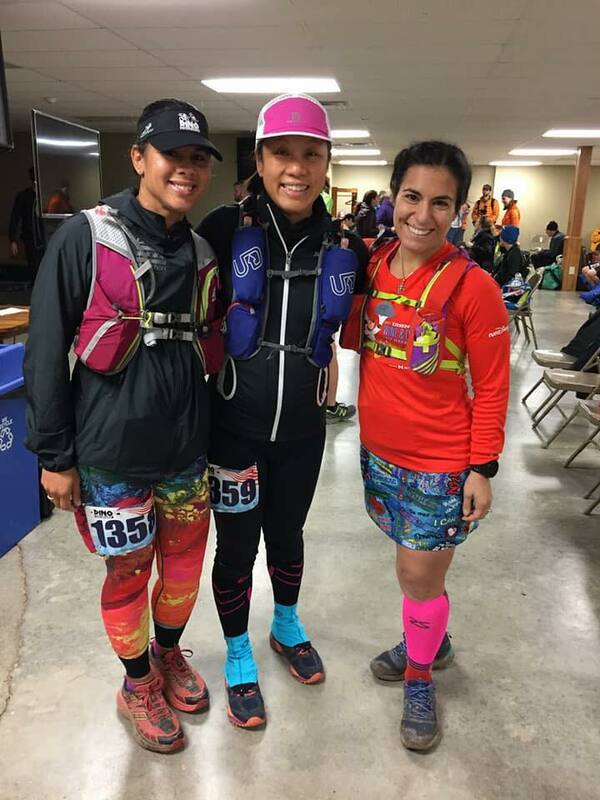 Initially, I was inspired by a fellow MRTT-er Danielle’s account of running the Rough Trail 50 k last year. I had done the 25K. When I talked to Danielle afterwards, she said her (amazing) teammates, which were downed with illness, would have been there if they could. I decided if the notion of an ultra was about defying borders, I would do it to defy my borders. Just to be clear, the glass border between me and the lion at the Louisville Zoo is a good border. Other arbitrary borders I faced while undocumented were not so good. Here in the woods, with tired legs, exhaustion, downed trees, ridiculous ascents and descents, the obstacles were not made up. I wanted to break through my desire to sit next to a vat of chips and salsa. During that third loop, my undocumented past and the limitations that came with it meant nothing. My immediate reality was that if I didn’t finish, I would be out in those woods alone. That ultra and pressing on was the only thing I could control. When the moon appeared, I took out my knuckle light. I was even slower in the dark. Angelo sent me a few texts thinking I was coming around the lake. I hated to tell him that it wasn’t me. I wanted to cry at some points but didn’t. During the Baltimore Marathon I did cry out of pain and poor nutrition. 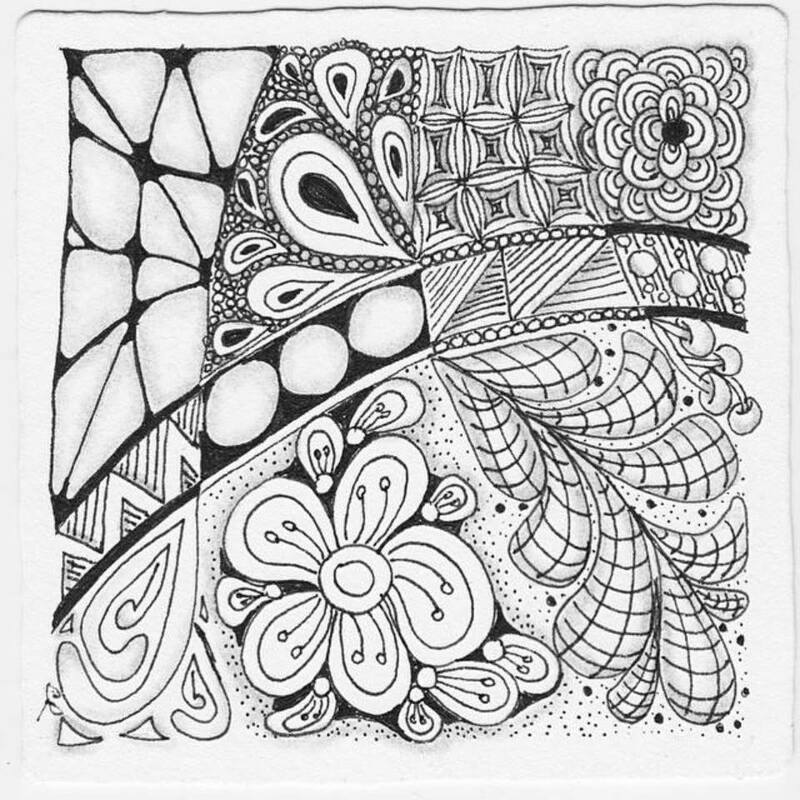 Now it was just out of frustration at my slow progress. When I came around towards the D.IN.O arch, Angelo, Julian and Harmony spotted me. It made me so happy to see Julian come across the border. He took my hand and pulled me towards the finish. I was proud to be there with him for my last race in 2017. I wanted him to see me finish, even though it was slow and lumbering. At some point he would know that it was a goal dreamed months ago. He would also know that that moment was dreamed from decades, without my documents, skulking at the border of a normal life. Despite my list of lessons learned, I relished my first 50 K completed. Reduced taper to 2 weeks instead of 3. Honey stinger waffles weren’t good in the cold. I preferred Lara bars. Make my own pbjs for a drop bag. I did actually eat chips and salsa afterwards. I ran 34 miles (55K) instead of 31 (50K) because of that wrong turn. I was on the course for a total of 10 hours, although Strava has me moving for 8 hours and 50 minutes. As disappointed as I was at not staying on course, I know for sure I can run more than 31 miles. This knowledge sparks a laughable ambition for more and opens the door for more adventures.